1.3 billion – The number of email users worldwide. 210 billion – The number of emails sent per day in 2008. 70% – The percentage of emails that are spam. 53.8 trillion – The number of spam emails sent in 2008 (assuming 70% are spam). 186,727,854 – The number of websites on the Internet in December 2008. 31.5 million – The number of websites added during 2008. 24.4% – The growth of Apache websites in 2008. 13.7% – The growth of IIS websites in 2008. 22.2% – The growth of Google GFE websites in 2008. 336.8% – The growth of Nginx websites in 2008. 100.3% – The growth of Lighttpd websites in 2008. 77.5 million – .COM domain names at the end of 2008. 11.8 million – .NET domain names at the end of 2008. 7.2 million – .ORG domain names at the end of 2008. 174 million – The number of domain names across all top-level domains. 19% – The increase in the number of domain names in 2008. 1,463,632,361 – The number of Internet users worldwide (June 2008). 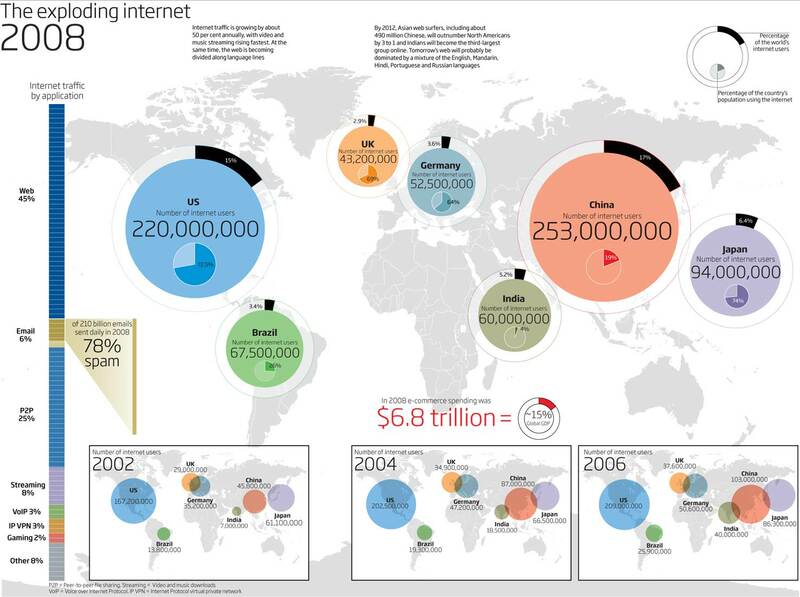 578,538,257 – Internet users in Asia. 384,633,765 – Internet users in Europe. 248,241,969 – Internet users in North America. 139,009,209 – Internet users in Latin America/Caribbean. 51,065,630 – Internet users in Africa. 41,939,200 – Internet users in the Middle East. 20,204,331 – Internet users in Oceania/Australia. 133 million – The number of blogs on the Internet (as tracked by Technorati). 900,000 – The number of new blog posts in a day. 329 million – The number of blog posts in 2008. 10 billion – Photos hosted by Facebook (October 2008). 3 billion – Photos hosted by Flickr (November 2008). 6.2 billion – Photos hosted by Photobucket (October 2008). 12.7 billion – The number of online videos watched by American Internet users in a month (November 2008). 87 – The number of online videos viewed per month per Internet user in USA. 34% – The increase in viewing of online video in USA compared to 2007. 3.1 – The number of minutes of an average online video.